had a bit of a panic as I don't really wear dresses very often, I tend to live in jeans, and most of the dresses I do posses are rather on the small side now! I was concerned that nothing would fit but was actually pleasantly surprised to be able to fit into a couple of dresses! I'm going to wear one that I wore to my birthday last year. I'm chuffed I can get into it... okay so it's got lycra, but still, I was about half a stone lighter the last time I wore it. Anyway, get to the point... right, so I took a pic to show Joe and ask for his opinion and I thought "ooh, actually look quite good in this!" and thought about when was the last time I had a pic of me in a dress. 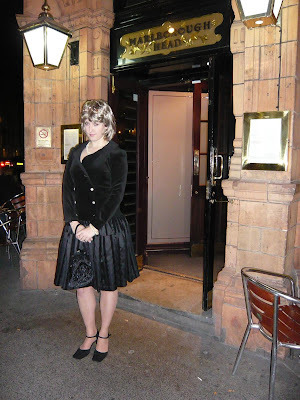 It was in April when I went to a 'back to the 80's' fancy dress party as Princess Di. I'd bought a genuine 1980's Frank Usher frock and was keen to wear it. I tried it on and I thought I looked great. 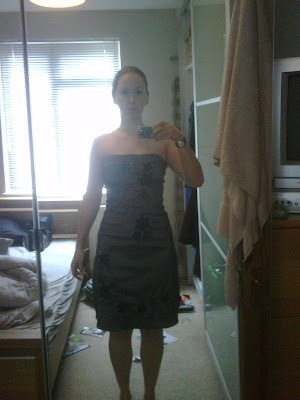 After the pic was taken (pre-party fuelling at a pub), I was horrified at how I looked!! I've put the two pics side by side for you to see, I hope you'll agree that some progress has definitely been made! Huge progress! That dress looks stunning on you - enjoy the wedding! Wow girl, you look incredible! Don't ever put down your progress compared to mine ever again! Well done, you look gorgeous and your dress is stunning! Thank you! :-) I did enjoy being able to get back into it!